This magnificent necklace features Necklace 18 inches 3 stranded Necklace. 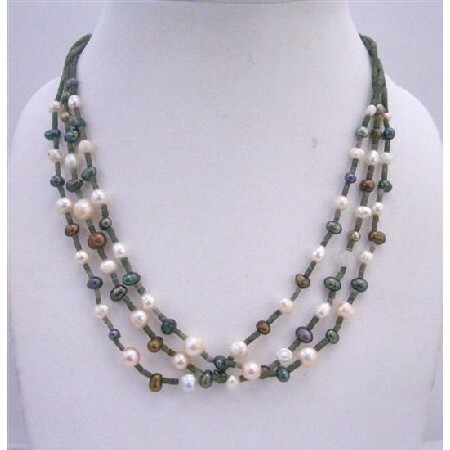 Features Freshwater Pearls: Metallic Brown Tumarine Green & White Pearls with simulated Dark Green Jade pipe shaped beads multi semi precious beads & freshwater Pearls accented in beautiful necklace. A cluster of iridescent semi precious beads Necklace dresses & would look pretty with many of dresses. Celebrate your individuality. Variations in the color & pattern of each freshwater pearls & jade beads add the beauty to the necklace.